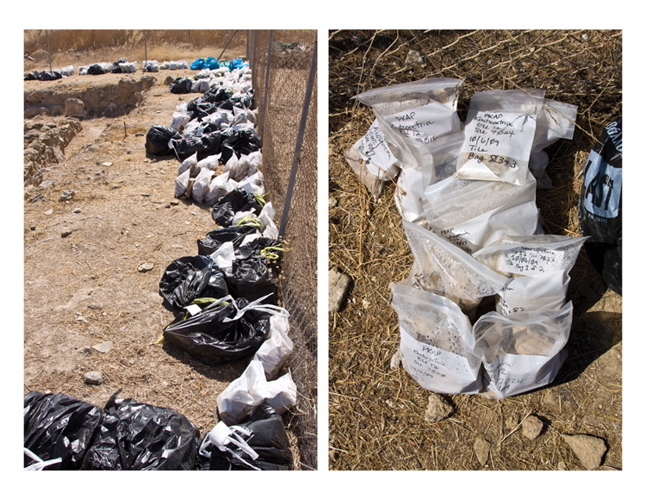 Ryan’s photographs of the Pyla-Koutsopetria Archaeological Project (PKAP) in Cyprus are about both the process of archaeology and the context of this work within complex landscape histories. The photographs show something of the physical nature of our work in the field as archaeologists, showing the faces and hands of the archaeologists but more importantly expressing the idea that somehow this presence forms part of a continuous and ongoing human presence in the landscape. The work values and explores that sense of intimacy between archaeologists and the landscape or site they study. Ancient conceptions of place varied widely between Aristotle’s preference for topos and Plato’s emphasis on chora. Aristotle’s topos suggests an objective point on a map that exerts no actual influence upon those who enter. Whereas Plato’s preference for chora, which draws upon the etymological root of “choreography,” as the reciprocal dance between humanity and environment. While topographic mapping and Global Position systems are remarkably helpful to research and convenient for day-to-day living, it is through continued presence and interaction in the landscape that allows the intimacy of chora to emerge from the plotted points and coordinates. While archaeological work relies upon topos, it cultivates chora. My work for the PKAP residency functions on several levels: documentary, landscape, and archive of topos and chora. By drawing upon both ancient conceptions of place, I was keenly aware of our contemporary presence in the landscape as researchers. This reflexive stance guided my efforts to document this emerging diachronic perspective of the historical landscape. As human presence transforms topos to chora it becomes archaeological evidence. Similarly, the photographic project provides a document of ongoing human presence and an archive of evidence of the 2009 PKAP field season and this Mediterranean landscape. Ryan Stander is currently completing an M.F.A. in Mixed Media at The University of North Dakota, his interests range widely across art and religion/theology. His focus is on the cultivation of place and its significance for human life; he states “approaching place from two disciplines offers a variety of unique conversation points, methodologies, and surprising trajectories”. Ryan hopes to follow the MFA with a Ph.D. in theology or religious studies. Hey Fotis! Would you like to contribute to the project? ?